Thousands of protesters who have been camping out near Wall Street have spilled out onto the roadway, causing the Brooklyn Bridge to be shut down. At least 700 people have been arrested, including a New York Times reporter. The clash and confrontation between NYPD and thousands of protesters took place on New York’s Brooklyn Bridge. 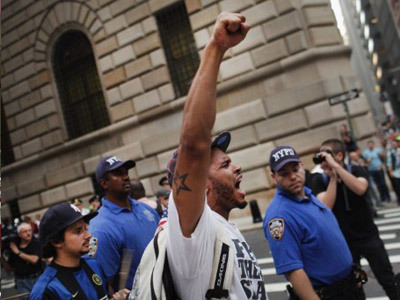 The demonstration started by Wall Street and then protesters rallied toward the Brooklyn Bridge. When they got on the bridge, the police cordoned off both sides of the Brooklyn Bridge and started to move in on the protesters to make arrests for blocking traffic and disorderly conduct. The protesters were banging drums and chanting, “The whole world is watching!” Police moved in, there were paddywagons brought to the scene, and things got very physical, RT’s New York correspondent Marina Portnaya reported. Witnesses say it is impossible to even count the amount of police officers that were dispatched to the scene. Clashes erupted, and they got violent. 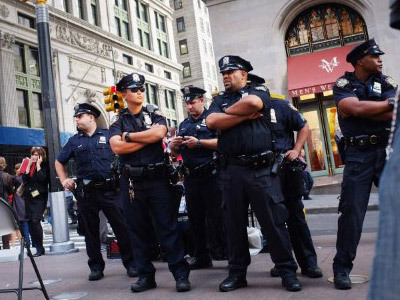 ­This is the most recent incident that has taken place in New York in past weeks. 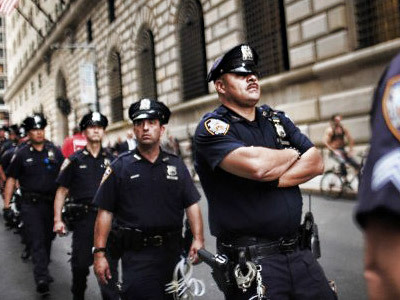 Last weekend police used netting to arrest demonstrators who were camped out on Wall Street. 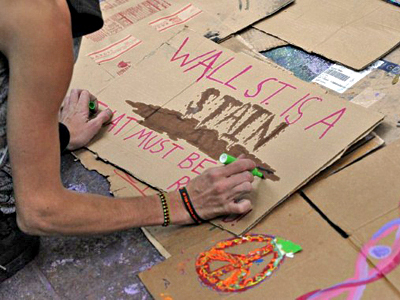 “Occupy Wall Street” is a group of Americans that have called on those that are frustrated about the economic situation in America right now to come down, rally and voice their opposition. Demoblaster: Protesters were REROUTED 2 Bklyn Bridge by the NYPD then entrapped by orange netting. Kristin Gwinne: They're arresting us one by one. I just asked a cop and they said they're going to arrest all of us. RDevro: Cheers as 4 girls, arms locked, make way off the bridge. One photog says he saw batons being used. 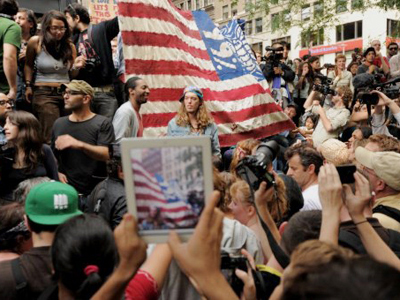 Right from the beginning of this protest two weeks ago, media reported on the crackdown on protesters by the NYPD. The conflict is evolving week by week, and is clearly getting much more confrontational. 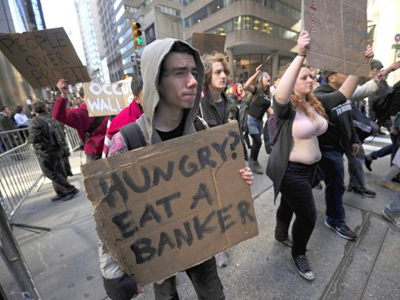 “Occupy Wall Street” are protesting against corporate greed and social inequality. The group has been criticized by mainstream media for not having one unified message. However, what unifies them is their frustration over the US economy, over the fact that people are losing their jobs, people cannot get jobs, and people are struggling to find money to make ends meet. ­Two dozen protesters – 15 women and nine men – have been arrested for trespassing during a demonstration against Bank of America's foreclosure practices at the banking giant's offices in downtown Boston. More than 3,000 people took part in the protest. “They wanted to be arrested, and we obliged,” Boston police Commissioner Edward F. Davis told The Boston Herald. 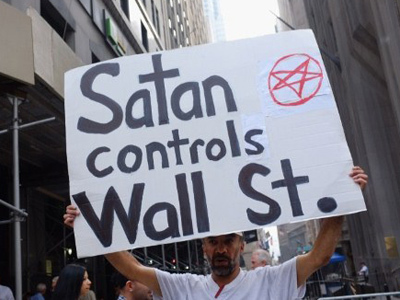 T.J. Crawford, Bank of America spokesman, claimed that the demonstration was merely a publicity stunt. “These individuals choose to ignore the facts and instead focus on increasingly aggressive PR stunts,” he explained.